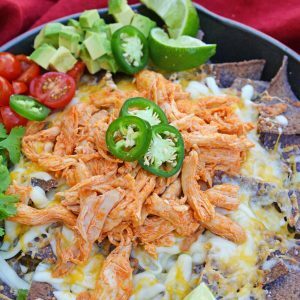 Buffalo Chicken Nachos are loaded with all of your favorite chicken nachos ingredients and topped with delicious buffalo chicken for extra flavor and spicy. Perfect for game days, holiday parties, or a Tex-Mex dinner. Toss shredded chicken in buffalo sauce. In a large cast iron skillet, spread out blue corn tortilla chips. Top with shredded Colby cheese. Place 3-4 inches from the top on high broil. Allow cheese to melt, approximately 1-2 minutes. Watch carefully! Remove and top with chicken. Turn off oven, but return pan to oven and close door for 3-4 minutes to let chicken warm. Garnish with fresh jalapeno, cilantro, tomato, avocado and fresh lime juice. *I used store-bought rotisserie chicken.